Underwater Portrait Photography- Why do it? I was asked the other day, "Why underwater?" And the question baffled me! I have a life long love affair with water and couldn't imagine anyone not loving everything water like I do. After thinking about it for a few days, I have come up with some really honest evaluations of what makes this genre so unique and why everyone should have underwater portraits done. First of all, water is symbolic. In literature and writing, it is used to symbolize transformation, cleanliness, fertility, and even life itself. In many religions such as Christianity and Hinduism, water is used to purify, clean, and transform their believers. Your body is made up of 70% water, and we would not have life without it. At the end of a long day, many people take a warm shower or soak in a bath tub to relax and feel the stress melt away. For me personally, I grew up swimming in a pool and my father taught me the magic and power of the sea. Why wouldn't we use such a commanding element in photographs? Underwater portrait photography is unique. As much as I love images of families in fields and posed studio portraits, underwater images are so much more extraordinary. I honestly would love to have an image of my mother or grandmother doing something like this because it is simply so special. Because the products created from our underwater sessions are archival quality, your children and grandchildren will be able to marvel at the beauty and elegance you create underwater. Each underwater session comes with an unforgettable experience. 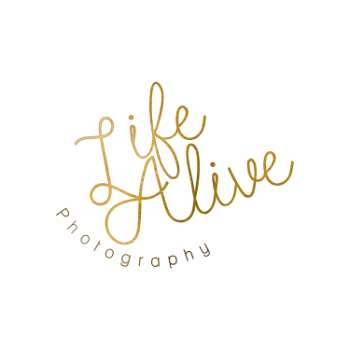 From the moment we speak, I do my best to make your experience with Life Alive Photography and your underwater photography session the most magical it can be. From helping you design your images to picking your outfit to guiding you through poses underwater to helping you choose which presentation you would like for your final art pieces, I create amazing client experiences. Finally, our time together culminates with archival quality commissioned artwork. The final pieces will be edited to perfection. Bubbles will be removed from your nose, stray hair removed from your face, and you will be in awe with how incredibly graceful you looked in a moment when you felt vulnerable. I spend hours per image hand editing each one to perfection. These images are printed on your choice of archival quality products and I guarantee your satisfaction. You can take a peek at some of the products I offer HERE. Ultimately, I cannot imagine a more meaningful photography experience and I would be delighted to provide this service for you. When you're ready or if you have any questions, you can reach me by clicking HERE, or by commenting below. I can't wait to hear from you! In the meantime, check out other underwater session images HERE. Rachel Jalanivich - Erica you're so sweet! Thank you so much! Rachel Jalanivich - Angela thank you so much! I really love doing underwater photography! Rachel Jalanivich - That's awesome! I love hearing such great feedback about underwater sessions! I would love to see your pictures! Angela Beransky - Underwater maternity photography is such a unique niche and you work is amazing! Johanna - Yes girl yes!!! Get all that beautiful art out there. <3 ! Erica Steward - Rachel you are amazing at these!! !